For Earlier Closing Announcements from Other Retail Brands like Walmart, Kmart and JCPenney Continue Reading Below. Of the mega retail giants staging going out of business sales in 2016 (including the Macy's Going Out of Business Sales), Walmart is closing the largest number of retail locations in the continental U.S. In all, Walmart will be closing 154 of its Walmart Express, Walmart Supercenter, Walmart Neighborhood Markets, and Sam's Club locations in states and cities throughout the U.S. (and more in Puerto Rico). What follows are complete lists of 2016 store closing locations by state and by address for Walmart, Kmart, Sears, and JCPenney, according to the information released by each of those companies as of January 16, 2016. If rumors, analysts, and pundits are correct, JCPenney investors would probably prefer that the list of JCPenney Going Out of Business Sales was longer. But the JCPenney leaders continue to resist massing store closings as a short-term turnaround strategy in favor of keeping a long-term foothold in the brick-and-mortar retailing space. This is a complete list of JCPenney store closings scheduled to happen in the 2016 calendar year. 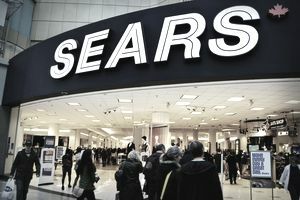 Sears Holdings is not as forthright as some of the largest U.S. retail chains when it comes to communicating about final store closings for its Kmart and Sears brick-and-mortar retail stores. So even though it was announced in January 2016 that 27 Kmart and Sears stores would be hosting Going Out of Business Sales in the 2016 calendar year, the retail liquidation location addresses and states were not made public. Sears Holdings didn't even want to tell investors, analysts, or consumers the exact number of stores that would be closed for each of their retail brands. So, what follows is the most updated and complete list of Kmart and Sears store closing locations and going out of business sales for 2016. Final Going Out of Business Sales dates will also be updated all throughout 2016. This Store Closing roundup list was last updated on January 19, 2016. Final Going Out of Business Sale Date: "end of July." Final Going Out of Business Sale Date: "mid-April." Final Going Out of Business Sale Date: "March." Final Going Out of Business Sale Date "end of July." Final Going Out of Business Sales for NY Sears Stores "End of July."